Manufacturers of bumpers, winches, and tire carriers for Jeeps. provides sales of fishing tackle and accessories, located in kennesaw, georgia. We are your wedding and family portrait specialists in Kennesaw, Georgia. 6 Adkins Air Conditioning and Heating, Inc. Kennesaw, GA.
Kennesaw, GA. based full service residential / commercial HVAC contractor. Includes product and price lists and employment information. Located in Kennesaw, Georgia. Provides swing-away tire carrier and the front bumper-winch, located in Douglasville, Georgia. Provides residential and commercial lending. Includes rates, company overview, online application. Based in Kennesaw, GA.
Kennesaw firm providing accounting and audit services to tax-exempt organizations and employee benefit plans. Located at Cobb County Airport, Kennesaw, and offering private pilot and instrument training. Manufacturers representative for industrial hose, metal and wire belt, fittings, sealants, adhesives. Kennesaw, GA.
a long haul truckload carrier. offering a detailed listing of employment benefits and incentives. online application submissions. Offers print and website design and copy needs including layout and editorial. Includes sample work and contact information. Kennesaw.. Produces orange juice, grapefruit juice and other citrus products. Manufacturers misting systems, humidity control and water filtration systems, located in Kennesaw, Georgia. Manufactures and distributes commercial-grade metal and wooden play structures and equipment. Includes product photos and specifications. Based in Kennesaw, Georgia. Adventure clothing, backpacking gear, emergency preparedness, located in Kennesaw, Georgia. Nursery in Georgia presents photo galleries of recent introductions, an alphabetic list of cultivars, and photos of the gardens. Checklist, sightings, and photo gallery. Owner, exhibitor and future breeder. Located in Kennesaw, Georgia. Owls. Contains news, schedule, roster, statistics and archive. We specialize in vintage biplane aircraft rides at Cobb County airport in Kennesaw, Georgia. Located in Kennesaw. Includes camp details, photos, class information and cost, history, and staff profiles. CFA and TICA registered breeder located in Kennesaw. Show news, cattery data, images, pedigrees and kitten information. Lists their achievements, coaching staff, news items, a roster with profiles, and a history of the team. Owls. Contains press releases, pictures, roster of players, game schedule, scores, and archived news. Kennesaw. 8,000 square feet of climbing space, including a 2,000 square foot bouldering cave. Bob Zarembas site with a guide to birding Kennesaw Mountain, trip reports, photos of rarities, and links. Located in Kennesaw, Georgia. Calendar, meetings, practices, officers, populace, households, events, pictures, links, mailing list, meeting notes. Uses frames. A site dedicated to teenaged archers with shooting tips, information about the club, and links to relevant sites, as well as a calendar of upcoming events. North Cobb High School in Kennesaw GA featuring schedules, latest news, and information on our junior program. Founded by Grandmaster Kwang Jo Choi, Choi Kwang-Do is a modern martial art based on principles derived from the scientific fields of biomechanics, kinesiology, psychology, chiropractics and psychoneurology. Includes programs, news and events, locations, products, affiliations and members. Located in Kennesaw. Specializing in sales, service and support maintenance on Microsoft Windows, Novell networks and computer telephony. Based in Kennesaw, Georgia. Internet service provider with internet filtering service, located in Kennesaw, Georgia. Meets first and third Fridays (first only in December), 7:30 pm, in Cobb County. Calendar, history, officers, map. A Christian punk band from Kennesaw, Georgia. kennesaw firm focusing on vaccine injury cases and immigration. Kennesaw. Includes dance schedule, profiles of caller and cuer, and contact details for club officers. provides information about the north cobb high school band in kennesaw, georgia. Progressive/Funk combo from Kennesaw, Georgia. Includes band member profiles, photographs and MP3 downloads of their live recordings. includes calendar, photos, directors profiles, student leadership directory, introduction to the drum majors. located in kennesaw. SiteBook Kennesaw City Portrait of Kennesaw in Georgia. 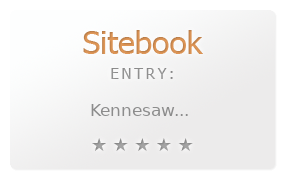 This Topic site Kennesaw got a rating of 3 SiteBook.org Points according to the views of this profile site.